Hyper Syntax is a fast-paced, couch-multiplayer game where players fly ships that leave deadly light trails behind them. 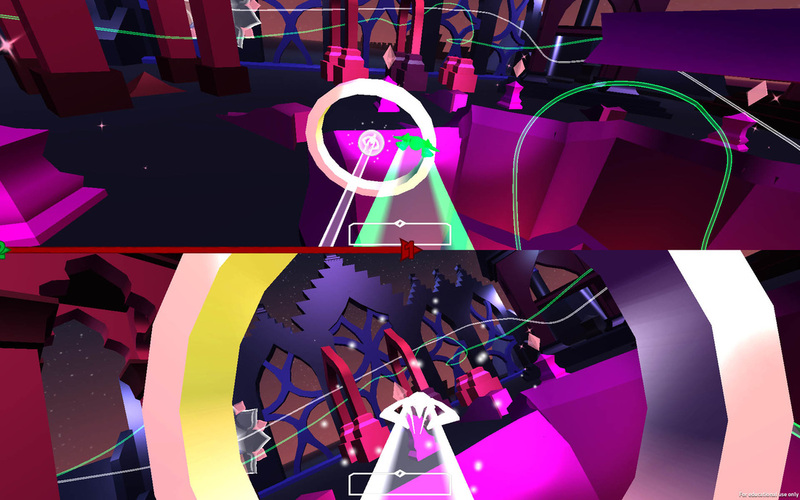 The player's goal is to find, grab, and hold onto a ring for a short duration without crashing while other players attempt to steal the ring. 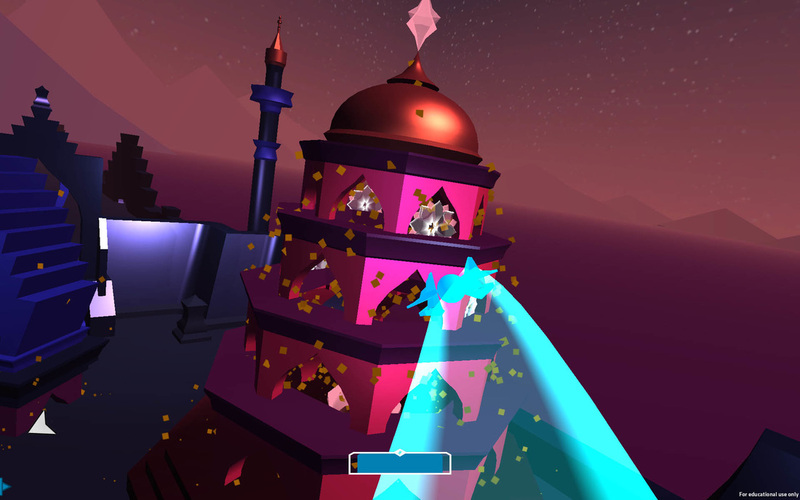 The ships that the players fly have a boost, an EMP, and a phasing ability to help players try to capture and hold onto the ring. Task: Create a level with many different areas to fly through so light trails can restrict movement but never stop it fully. Solution: I designed and arranged the structures in the level so that there were no dead ends for the players to get stuck in. When a path became clogged with light trails, there was always another path the players could take. I started the level creation process by making some simple block outs in Unity to get a feel for what spaces would be fun to fly through for players. I found that open spaces were boring and that flying through, around, and in between objects was the most compelling. After several stages of iteration, I finalized the basic layout and moved into Maya. Once I found a block out that received overall positive feedback in QA, I started working on a more polished version of that block out in Maya. Doing this allowed me to have better control of the geometry and easily create more complex structures for the player to Explore. After a few weeks of testing and iterations, I arrived at my final block out that was then passed off to the level artist. I then started adding in motion to my level as I neared the completion of my final block out. 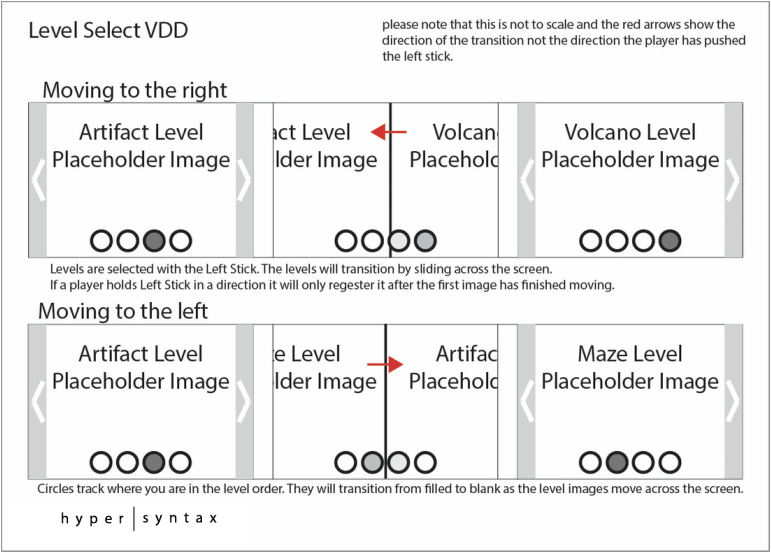 From the beginning of the project, I believed having dynamic levels would enhance the player experience. I started my focus on the artifact; I wanted its movement to be very compelling for players. Through testing I found that the impact of the artifact was lost due to buildings blocking the players view of it at the beginning of the match. In an attempt to give the artifact a stronger impact on the level, I tested having the temples in the level rise from the ground. I received very positive reactions regarding this so I worked on making it a key part of the level. After receiving the final art for the level and adjusting a few scripts to work better with the new art, I turned my focus towards creating effects that would help make my level a memorable experience. I started with some basic particle effects on the buildings where they rise from the ground. These were for player feedback so it would be immediately clear to players that the buildings were moving. I then scripted a unique interaction that I wanted players to be able have on my level. In the final artwork there were several floating crystals. I thought it would be fun for players to be able to EMP the crystals to change their colors. While this doesn't improve the player's chances of winning, it does give the player more agency in the game. 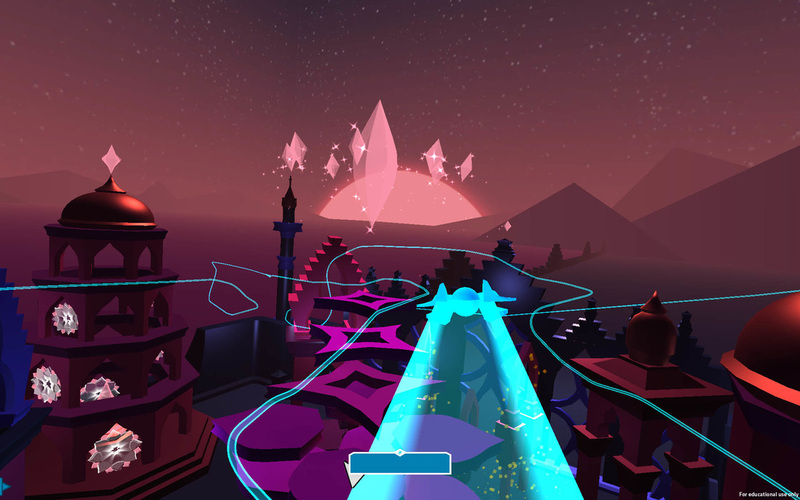 I then created a simple sound to be played when the crystals are EMPed to add to the satisfying feeling of the interaction and to provide player feedback that their action accomplished something. Task: Design additional menus needed for the game that are intuitive to navigate and fit in with the current menu's design. 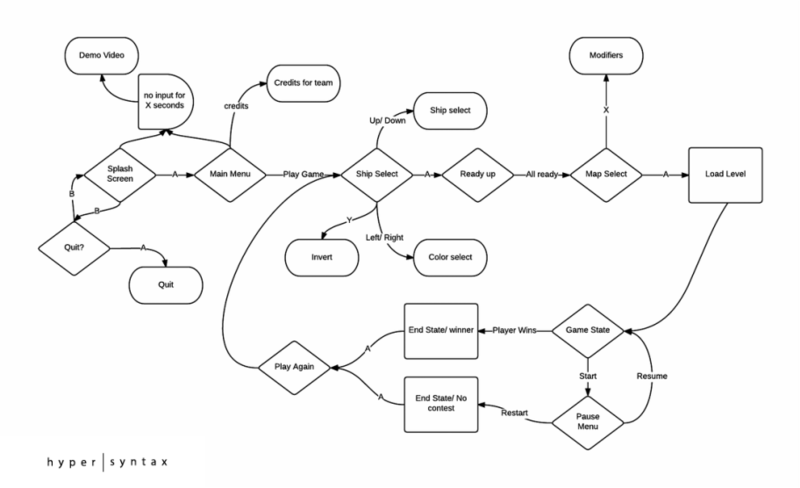 Solution: I designed each menu to have a clear purpose and uniform navigation so players could get to the game as easily and quickly as possible. At the beginning of the project, we had several ambitious ideas to potentially include in the game. 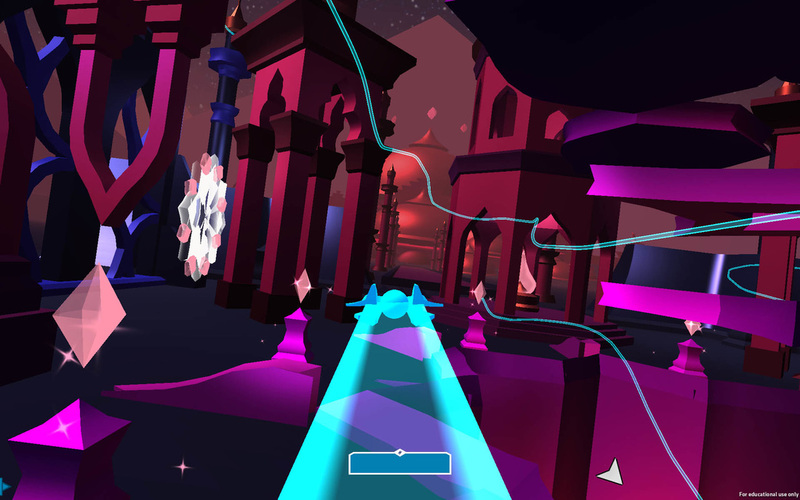 These ideas ranged from networked multiplayer to multiple game modes. As we progressed we had to cut some ideas to stay in scope. The original menu flow document I made allowed us to visualize the complexities of our design. Seeing the complexities of our ideas on paper helped us to eliminate unnecessary systems and stay within scope. The document was refined once it was decided which features were in scope and which were not. I created a quick visual design document for each menu screen that outlined how I imagined it functioning so the programmers could quickly make the menus. I became very familiar with the code surrounding the UI. This allowed me to iterate on the games menus using player feedback and implement new art assets as they were made. 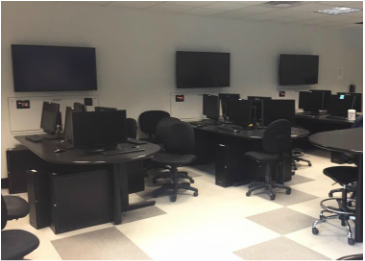 I became self dependent in this area allowing our programmers to focus on other aspects of the game once the core infrastructure was set up for a menu. Understanding the code was very helpful for being able to quickly implement user feedback. One example of this was with the speed it takes transition between levels on the level select menu, I received feedback saying that this transition was too slow. I was able to then sit down with that person and do some A and B testing on what they thought was a better speed. From the beginning of the project I wanted to include a modifier menu to allow players to change up the base gameplay. I created a simple VDD for how I envisioned the modifier menu working and presented it to the team. I included a list of possible modifiers, I knew the full list was out of scope but I wanted feedback on what the team would want to include. 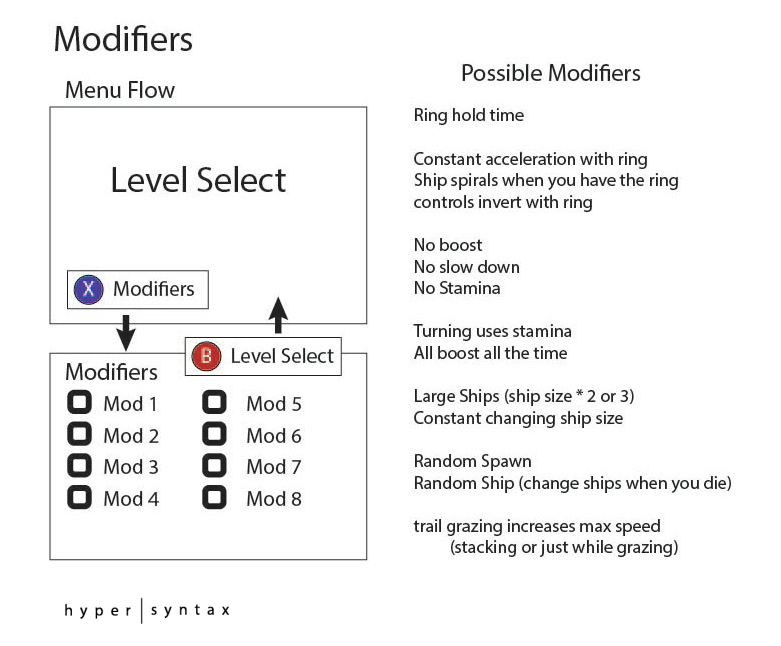 After receiving input I began working with one of our programmers to figure out what modifiers would be in scope. The final modifiers chosen were Ring Hold Time, Number of Bots, No Boost, No Slow Down, Always Boosting, and Unlimited Stamina. The modifiers were quickly implemented and received positive feedback from QA. 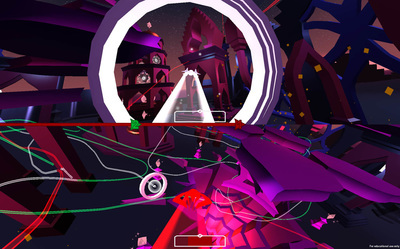 The music in the game was created by Darc, and independent EDM group from Edinburgh. I am friends with a member of the group and reached out to them on behalf of Hyper Syntax to use their music in our game. I acted as the liaison between the two groups through the production process. I attended multiple QA sessions to help run the tests with our QA liaison. Whenever I made a significant change to the Artifact level I would make a point of showing up to QA to get direct feedback from testers regarding the changes. Talking to testers help me understand why they made the comments that they did because I could ask follow up questions if I didn't understand their initial response.